Mignon, is daughter of Congressman Clyburn from South Carolina, was nominated by President Barack Obama and appointed by the senate to the Federal Communications Commission (FCC) in 2009 to serve out a vacated seat and appointed again in May of 2013 for five year term which ended in June of 2017. She will remain in the position until someone is appointed or until January 2019 according to Wikepedia. She is an advocate for Net Neutrality and limiting cost of calls for inmates which have been exorbitant. She has since, the new 2017 Trump presidency, been in battles to resist rollbacks of Obama consumer rights protection regulations. Ajit Pai, now Chair has sought to eliminate regulations that required internet provider engagement in providing broadband to rural areas and Lifeline programs for low income citizens since 1980. 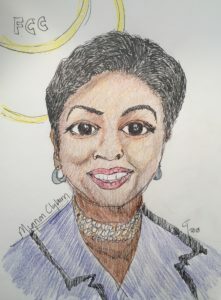 Mignon Clyburn has been a voice of defense for consumer protection and access. The recent Net Neutrality vote was 3-2 to repeal along party lines. She continues to speak out against this vote and repealing of other consumer protections for a more open internet instead of the Trump selected Ajit Pai’s directive to deregulate in favor of internet providers. Her twitter account is twitter.com/mclyburnfcc. Mignon Clyburn is front and center in the Net Neutrality/Open internet battle where so many of us are on the fringes of understanding. The big issue will be the downside of repealing Net Neutrality. What is the impact of this new ruling by the Federal Communications Commission (FCC)? Ms Clyburn’s extended time on the FCC has been fighting for the internet to continue being a level playing field. It was one of those opportunities for many to build wealth by running small successful businesses that compete with the giants. With Net Neutrality we all rolled together. The repeal of Net Neutrality is like a main highway being dominated (according to the new ruling) by internet providers like at&t, Spectrum, Verizon, etc. and you can’t get on a ramp (they are closed) so you will have to use the side roads to get to your destination, which will take you longer and may even cost you more for less. This gives more control and license to the providers to affect your access to the faster internet and in some cases where you are able to travel as well. Of course the other giants affected like Apple, Google, Microsoft, etc. need the providers to deliver content; add in dot com companies like Go Daddy and now you have fierce competition for access, cost of services, and slowed traffic. For example, if you live in a high traffic area like DC/VA/MD then you are familiar with separate fast traffic lanes for rush hour traffic. Once upon a time a single driver could get on before or after the designated times for heavy traffic for free. Now everyone has to pay something and don’t even know how to qualify during certain hours to use the fast lanes. A sticker is also needed so I stay in and negotiate the heavy traffic in the free lanes. Okay. Imagine, Google gets on (exist on) the internet provider’s highway, they can afford to pay. How do we pay to use Google? If you want faster internet speeds and you are a little guy you may end up having to search less or spend more money, do early morning or late night internet, use your company’s internet, or plan longer times on the slower lower cost effective internet options. Thus far I have been told that things won’t change, this coming from an at&t employee. Ever since the ruling, my phone has been acting up. My one gig of data is used up in no time and my phone is slowed down with all those apps (Is that the Apple battery?). Oh yes, I presume that there will be more successful applications than others. All these data hogging game apps require high-speed internet if they can afford it (rich kids) or even get access (not so rich kids). Of course, this is a blog and my take on what will happen to change your experience of the Wi-Fi, broadband, on the internet, (some businesses have already migrated to ‘internet two’ that is more secure and paid for by the corporate users to protect information like IBM.) Who’s staying and who’s going? Will you be able to download that assignment fast enough to work on it and upload it before the deadline? If it takes one to three minutes to get on Facebook are you going to use it? What about access to the cloud? What about ‘Snapchat’ quick contact video? How many people will drop off YouTube? How will we know what is going on in the world? Who will know what’s up? Mignon Clyburn’s tenure may be ending at the latest in January 2019, but the battle she had forged will hopefully help you and I better understand when someone says GO VOTE and you don’t bother, the domino affect will be more than you or your relatives and friends bargained for. (The banana republic!) In a global economy you cannot afford to check out if you want to make a living. You need the internet! Mignon Clyburn understands this and is still actively advocating and defending against the repeal. Look her up! She is knowledgeable and our protagonist on the impactful Federal Communications Commission (FCC). We at lillianonline.us salute her passion and advocacy.